This large, double-jointed pier is 100-year-old landmark and home to family amusement park, the Santa Monica Pier Aquarium, an arcade, trapeze school and more. Not sure where to start? 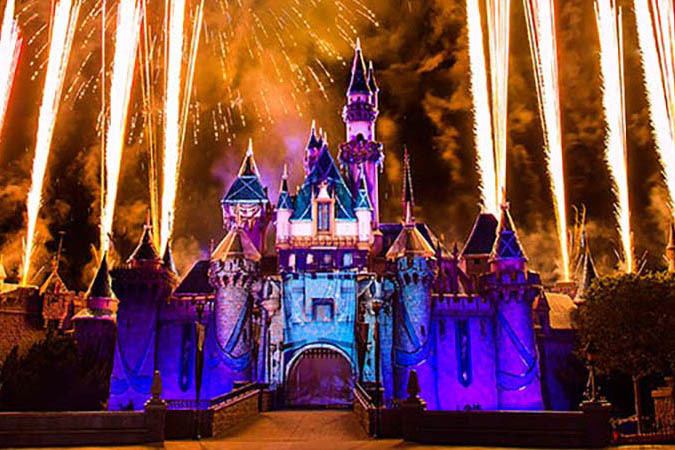 These are the most popular attractions and tickets for first-time visitors. 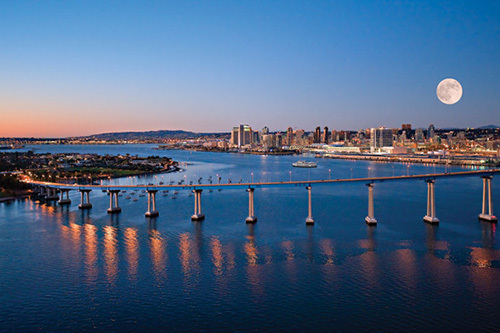 Experience the highlights of the city with these suggestions! Limited Time Offer: FREE admission to your choice of SEA LIFE Aquarium or LEGOLAND Water Park. Valid for visits between 4/22/19-5/24/19. 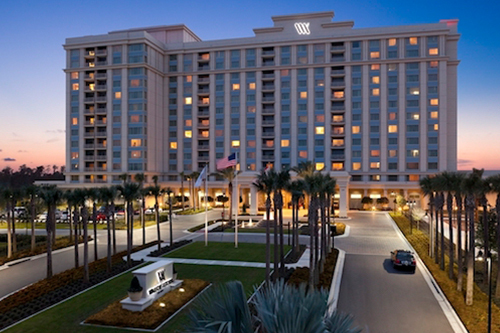 Plus, save 15% on stays at LEGOLAND Hotel! Los Angeles Go Card can be used for admission to Universal Studios on any day but must be redeemed at the gate by 5:30 pm. Limited Time Offer: FREE admission to your choice of SEA LIFE Aquarium or LEGOLAND Water Park. Valid for visits between 4/22/19-5/24/19. 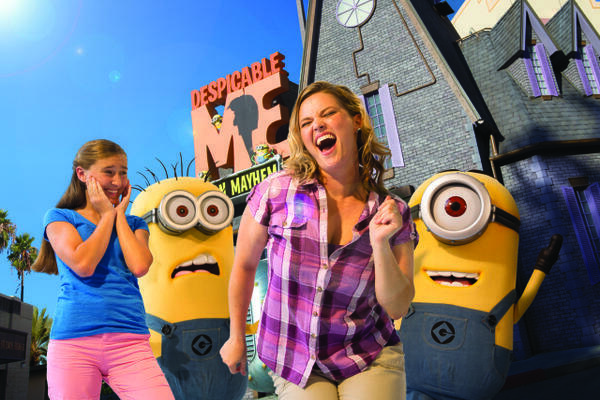 Plus, save 15% on stays at LEGOLAND Hotel! With your Go Los Angeles Multi Attraction Pass, you'll get access to 30+ attractions for three (3) calendar days within two weeks of first use. Plus, you can skip the line at top sights and save big with special discounts. 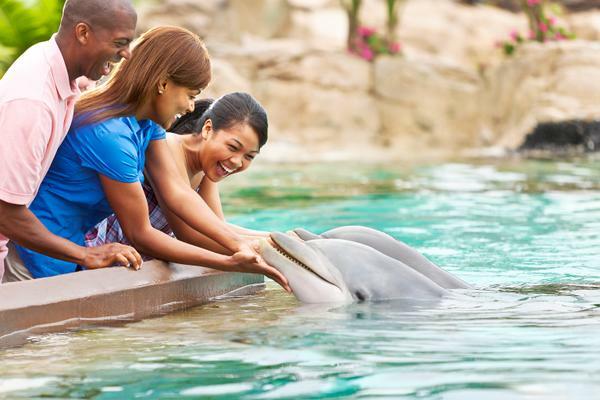 All-Inclusive Visit to any or all of the included 30+ attractions. Visit as many attractions as you want, 9am to 5:30pm. Save Money Up to 55% off gate prices. 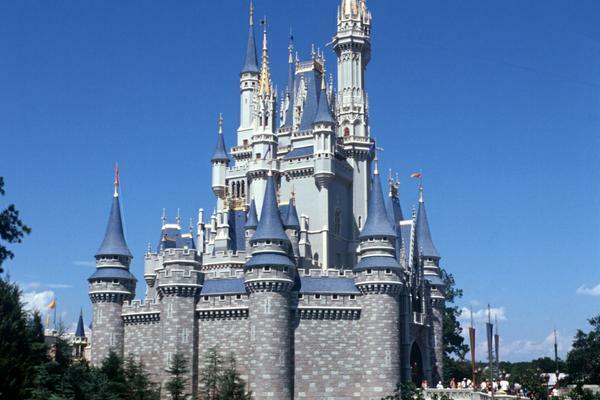 More Fun Unlimited visits to many top theme parks. Los Angeles 3 Day GoCard is valid for 3 calendar days. Guests must enter the park between 9am and 5:30pm. *Note: 'calendar days' are not 24-hour periods. For example, if you activate a 3-Day pass on a Monday evening, it is valid for the remainder of Monday (1st calendar day) and any 2 additional calendar days within two weeks of activation. E-Ticket is valid for 1 year from purchase date. Card expires after 3rd day of use. 3rd day must be used within 2 calendar weeks of 1st day of redemption. This is a great way to see the sights of LA! 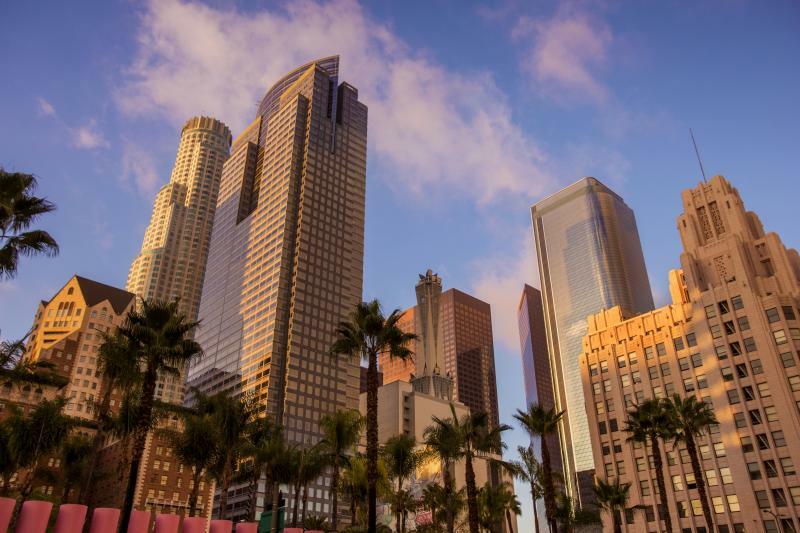 With over 50 stops, 4 routes, and 2 connector lines, this fully narrated double decker bus city tour is one of the best and most flexible ways to explore the City of Angels. The Purple Route lets you experience the buzz of Downtown LA - Chinatown, Little Tokyo and Grand Central Market. Hop on over to the Red Route for the glitzy and glamorous Hollywood and Beverly Hills areas where you'll see the iconic Hollywood sign and famous Walk of Fame. Admire the colorful billboards and cool atmosphere of West Hollywood’s Sunset Strip, ritzy Rodeo Drive and hip Melrose Avenue. Visit the historic Chinese Theatre on Hollywood Boulevard, where you can see hundreds of celebrity handprints and autographs, even the magic wand print of Harry Potter star, Daniel Radcliffe. 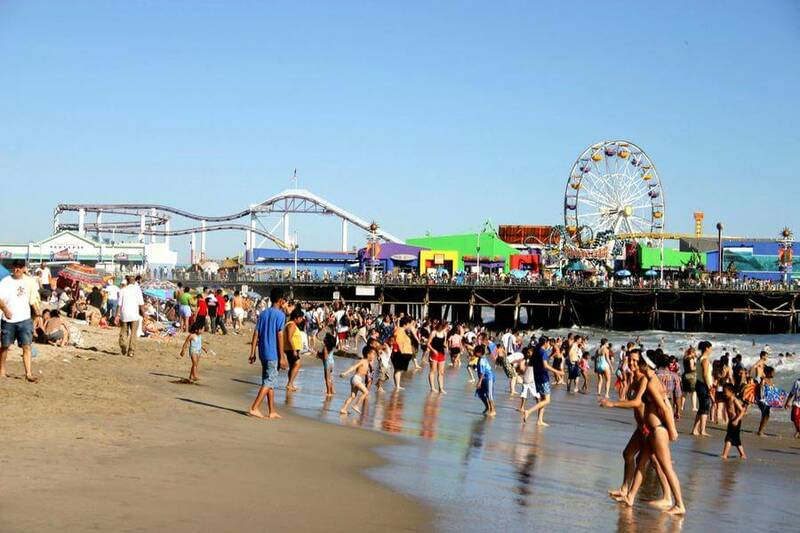 Then hop on the Yellow Route take in the sights and gaze at the beautiful beaches and landscape of Santa Monica. 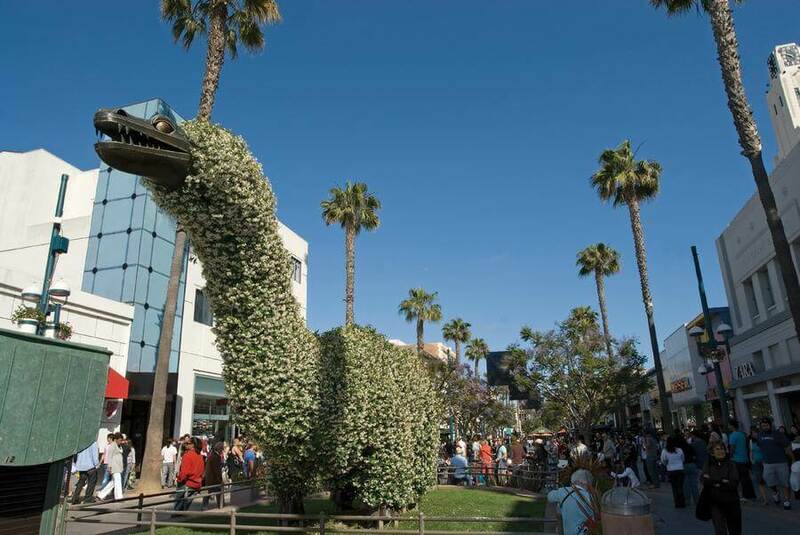 On the Green Route, you'll hop over to funky Venice Beach and its legendary boardwalk and also experience Marina Del Rey. To link with Universal Studios and the Chinese Theatre, take the Blue Connector. Choose between a 24 or 48-hour pass and don’t miss any of the great sights LA has to offer! Frog Family Tip: For those who just want to explore 2 routes we recommend the 24-hour pass. If you want to see more of what Los Angeles has to offer, we recommend choosing the 48-hour pass. Please, advise the address, city and zip code of your hotel. TCL Chinese Theatre - 6925 Hollywood Boulevard (open daily from 9am-6pm) or at any of the designated stops. Refund policy is in accordance with the cancellation policies. The E-Tickets must be unused and unsigned. Expired E-Tickets, or any ticket not currently sold on this site, are non-refundable. Please contact our customer service team so we can give you instructions to make the process run smoothly. * This ticket’s final Cancellation Policies will be displayed in your Shopping Cart and on your E-Ticket. Ticket expires upon redemption or 21 days from service date. Whichever comes first. Flexibility. Convenience. Value. Hop to it! The Go Los Angeles Multi Attraction Pass is the ONLY multi-attraction pass that gets you into over 30 top attractions in the city for one low price. 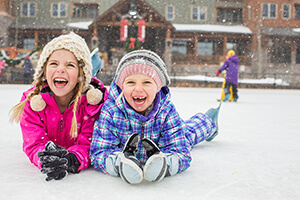 Plus, you can skip the line at top sights and save big with special discounts. Los Angeles 1 Day GoCard is valid for 1 calendar day between 9am and 5:30pm. E-Ticket is valid for 1 year from purchase date. Once activated, card expires at the end of calendar day. Los Angeles 2 Day GoCard is valid for 2 calendar days between 9am and 5:30pm. E-Ticket is valid for 1 year from purchase date. Card expires after 2nd day of use. 2nd day must be used within 2 calendar weeks of 1st day of redemption. With your Go Los Angeles Multi Attraction Pass, you'll get access to 30+ attractions for five (5) calendar days within two weeks of first use. Plus, you can skip the line at top sights and save big with special discounts. 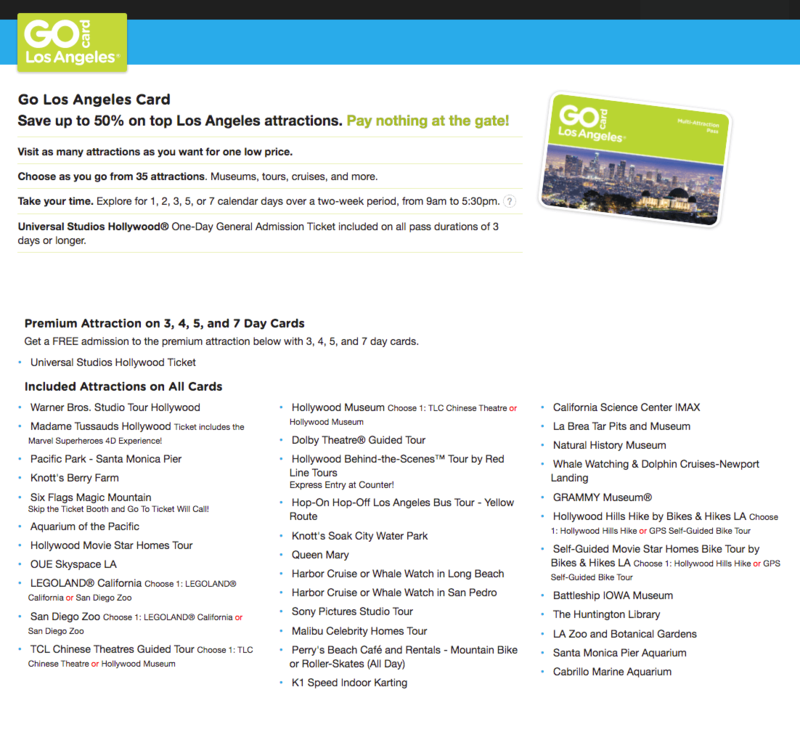 Los Angeles 5 Day GoCard is valid for 5 calendar days. Guests must enter the park between 9am and 5:30pm. E-Ticket is valid for 1 year from purchase date. Card expires after 5th day of use. 5th day must be used within 2 calendar weeks of 1st day of redemption. With your Go Los Angeles Multi Attraction Pass, you'll get access to 30+ attractions for seven (7) calendar days within two weeks of first use. Plus, you can skip the line at top sights and save big with special discounts. Los Angeles 7 Day GoCard is valid for 7 calendar days. Guests must enter the park between 9am and 5:30pm. E-Ticket is valid for 1 year from purchase date. Card expires after 7th day of use. 7th day must be used within 2 calendar weeks of 1st day of redemption. Pedal your way around Los Angeles and its glamorous sights on this 32-mile bike tour which takes you to the most popular city spots and beautiful beach towns. Starting on historic Route 66, you'll bike through picturesque Santa Monica, glitzy Beverly Hills, SoCal cool Marina del Rey, and wacky Venice Beach. See the mansions of the rich and famous and take in their grand sizes. Bike through Culver City - home of movie and TV production studios including MGM. With plenty of rest breaks and time to walk around, you'll be able to soak up the sun, burn off some calories and take in the great LA views! Plus you'll have a 30-minute lunch break right on the beach. But please check-in by around 9:30 am. E-ticket is valid only on date of service and expires upon redemption. New date selected – check below for updated pricing! Tickets can be used on non-consecutive days! Valid any days from - Daily values shown in calendar exclude tax. Select ticket quantity and add to your cart. Love our Frog Family planning tools? Share them with a friend!